Healthy Children > Ages & Stages > Baby > How Active is Your Baby? You might not think of the first few weeks of your baby’s life as being a time when she’s very physically active (although you will probably feel that you and your spouse are being run ragged in caring for her!). True, she’s certainly not able to run through the park or throw a ball to another child at this age, but there are still many opportunities for her to begin to develop motor skills that she can build on for a very active childhood and adult life. For example, have you noticed that your infant has started kicking during the second month of life? Even though this movement is mostly reflective at this point, before long she’ll be able to flex and straighten her legs whenever she wants to. By the time she’s 3 months old, your infant may be able to start kicking herself over from her front to her back (later, by 6 months of age, she’ll start rolling from back to front). At about 3 to 4 months, when you hold her upright with her feet resting on the floor, she’ll push down and straighten her legs as though she were standing on her own, and she’ll probably discover that she can bend her knees and bounce. Beginning at about 5 months of age, your infant will be able to raise her head while lying on her stomach and then push up on her arms to lift her chest off the floor or bed. Rocking on her tummy, she may kick her legs and move her arms as though she were swimming. Before long, your infant will be rolling over at will. At about 8 months, she’ll be able to sit without support and catch herself with her arms and hands if she starts to topple over. She’ll also pick up and move objects from one hand to the other. In the last few months before her first birthday, your infant may seem like she’s in constant motion. She’ll grab her feet and try putting them in her mouth. She may fidget and kick throughout every diaper change. Between 7 and 10 months of age, she’ll begin experimenting with and then mastering the art of crawling. Next, right around the time of her first birthday, she’ll take her first steps (it may happen a little earlier or a little later from one child to the next, all within a normal range). As your baby develops, take advantage of every opportunity to help stimulate her mind and body. From the earliest weeks of life, walk around the house while holding and interacting with your baby and say aloud the names of the objects that the 2 of you encounter. Before long, she’ll want to reach out, touch them, and pick them up. Also, talk to your baby whenever you’re with her. Whether you’re changing her diaper, bathing her, or driving with her in the car, keep the conversation going. Babies love the sound of their parents’ voices. See how she responds and how she communicates with sounds by moving her arms and legs. Here are some other activities that you and your baby can do together. Read out loud to your baby. Play some music and gently dance with her in your arms. Sit and play with her on the floor. She will love interacting with you. Try teaching her peekaboo and patty-cake (they can be stimulating for your baby and will help her develop motor skills). Hug her frequently and provide her with loving physical contact. Hold your baby as often as you can. Put her in the stroller and take her for a walk. It’s a good way to expose your child to the world around her, and it’s great exercise for you. 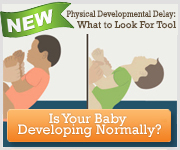 As your baby continues to grow and develop, her level of activity will increase. Make sure she has safe and soft toys to play with. They should be small enough so she can pick them up, but large enough so she can’t put them in her mouth.